Posted by Richard Foote in Exadata, Oracle Indexes, Storage Indexes. As discussed previously, there are quite a number of differences between Storage Indexes (SIs) and Database Indexes (DIs). However, there are also a number similarities between both of them as well. The obvious one is that they’re both designed specifically to reduce the overheads associated with retrieving the required data out of the database. Both index structures provides a method by which Oracle can avoid having to read every row/block in a table when searching for data of interest. It’s just the actual implementation of this mechanism that differs between the two general index types as I’ve previously discussed. The efficiency of both index types is very largely dependant upon the clustering of the indexed data within the table (i.e. the index Clustoring Factor). The better the clustering of the related indexed data within the table, the more tightly coupled the required data is likely to be and so the more efficient both index types would be in avoiding accessing unnecessary data. If the required data were to be less well clustered and randomly distributed throughout the table, the less efficient would be both index types in retrieving the necessary data. Some actual examples of this to come in future posts. Both index types have a period of “warming up” before being fully effective. It’s simply the manner in which this warming up process occurs that differs between the two. Database indexes on a freshly bounced database server initially incur substantial physical I/Os (PIOs) until the related index/table data is cached within the database buffer cache (and indeed in the flash cache). These PIOs can significantly reduce the performance of the SQL plans utilising database indexes. Storages indexes on a freshly bounced storage server need to be recreated and can’t immediately eliminate accessing unnecessary storage regions. This can significantly reduce the performance of Full Table Scans until the associated SIs are fully created. Again, some actual demos on all this to come in future posts. Both index types can use “Index Combine” like logic and use multiple indexes in combination with each other to further reduce the actual number of table blocks that need to be accessed to retrieve the data of interest. Storage and Bitmap database indexes are especially suited to these types of index combine operations, although B-Tree indexes can also be used in this manner. SIs are structures that exist only within the storage servers of an Exadata box, while DIs logically exist and can be accessed within the database servers. SIs are purely memory only structures while DIs are physical segments that take up storage. As such, DIs are relatively expensive to both create and subsequently maintain as they generate considerable undo and redo within the database, can cause concurrency issues and require storage resources. SIs meanwhile require no physical storage and have little impact on DML operations. SIs are generated automatically and transparently while DIs generally need to be explicitly created (except in some scenarios such as in the creation of Primary/Unique keys when they can be implicitly created). SIs being memory only structures are transient in that if a storage server were to be restarted, the corresponding SIs are lost and need to be re-created. Additionally, Oracle may decide to drop a SI for a particular column and create one on a different column depending on current load and conditions. DIs are permanent objects that need to be explicitly dropped (except in some scenarios such as the dropping/disabling of Primary/Unique Key constraints when they can be implicitly dropped). SIs can be stored in memory as they contain very brief summary information, just the min/max value and a null flag for each 1MB storage region. A corresponding DI (especially a B-Tree) would generally be significantly larger as it needs to store all indexed values from the table with associated rowids (unless compressed but still likely much larger even so). SIs can index only a portion of a table at a specific point in time as they get generated and dropped (see above). DIs index the entire table/partition (prior to 12c), unless using smarts such as decode function-based indexes (which also index the entire table but based only on the results of the function). SIs are limited to only 8 columns whereas DIs have no such limitations per table. SIs reference a 1MB storage region whereas a DI references a specific database block (say 8K). Therefore, a DI is more “focused” in terms of the minimum amount of data that needs to be accessed. SIs basically work by determining which areas of storage can not possibly contain data of interest, accessing just those storage regions that might contain data of interest. Therefore, it’s quite possible for a SI to generate false positives by having to access storage that might in the end not actually contain data of interest after all. A DI meanwhile via the rowid explicitly points to the exact location of an indexed value and does not generate false positives. A bitmap index is a little different in the manner in which rowids are stored and generated (and can have 0 bits set for rows that don’t actually exist) but again do not generate false positives when actually accessing the table blocks. SIs are only used during Smart Scan operations, which in turn are only performed during direct-reads of full scans of larger database segments (tables / indexes / materialized views and partitions thereof). Therefore SIs are only used when DIs are not. As SIs access data during a Smart Scan, the resultant data by-passes the Database Buffer Cache and can not be re-used by subsequent database users/operations. Therefore, SI accessed data may need to be frequently physically re-accessed. DIs perform single block reads (except for Fast Full Index Scans) which are cached in the Database Buffer Cache and which can therefore be globally reused by the database. Once cached, it may be unnecessary to subsequently physically re-access the DI retrieved data. SIs are used, even if the majority of the data needs to be accessed regardless. As SIs are only used during a FTS, the concept of only using an index when it’s the cheaper alternative doesn’t apply to SIs. If a SI can save (say) just 5% of physical I/Os during a FTS, it’s better than no savings at all. DIs meanwhile are only used when the Cost Based Optimizer (CBO) considers it the cheapest option when accessing data. As SIs are storage based structures, the CBO has no knowledge of their existence and play no part in the CBO cost calculations. DIs are fully known to the CBO and the DI related statistics are an important factor in the CBO calculations. The CBO only determines whether a FTS is the cheaper alternative, however the decision to perform a Direct-Read operation and so potentially enable the use of SIs is a run-time decision not made by the CBO. SIs can be effectively used for IS NULL predicates, thanks to the null existence flag component of the SI. B-Tree Indexes can’t if all indexed columns are null (as such entries are not indexed) although Bitmap indexes can. SIs can not be used to police Primary/Unique constraints. DIs can. SIs can not be used to avoid performance issues in relation to Foreign Keys (such as locking implications and FTS requirements on child tables when deleting parent rows). DIs can. SIs can not avoid sort operations. DIs can as data read via an index range scan is guaranteed to be returned in the order of the index entries. SIs can not provide additional statistical information to the CBO, such as accurate selectivity information in multi-column predicates available in concatenated index distinct keys statistics. DIs can. SIs can not be used to efficiently access the MIN/MAX of a column. DIs can. Function-Based SIs are not supported. Function-Based DIs are supported. SIs can not be treated as smaller tables and used as an alternative by the CBO to access just index related data, eg. select count(*), select indexed_column, etc. as SIs do not contain all the required data and are not visible to the CBO anyways. DIs can be treated as smaller tables and accessed accordingly if appropriate. In the following posts, I’ll go through the benefits of SIs and show examples of how they’re implemented and used by Oracle. 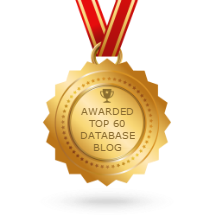 WordPress reported that my last post on Exadata Storage Indexes was my 250th !! Thought I might discuss Exadata Storage Indexes, explore what they are, how they work and discuss their advantages and disadvantages. Following is but a brief introduction on this very cool Exadata feature. 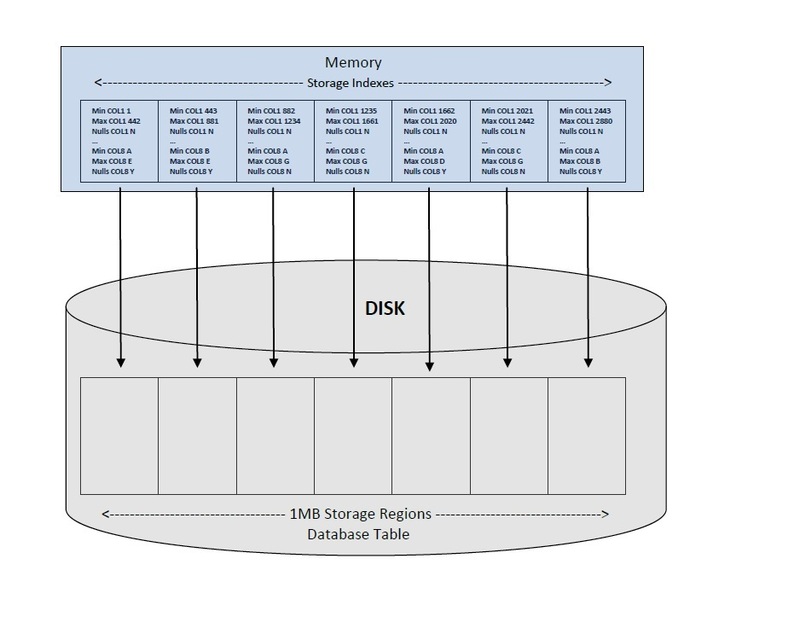 A Storage Index basically maintains summary information about database table data down on the Exadata storage servers. The information consists of the minimum value, the maximum value and a flag to denote whether any Nulls exist for up to 8 different columns within each 1M storage region of disk. My little diagram above attempts to describe this (click on image for a larger version). The Storage Indexes are created automatically and transparently based on the SQL predicate information executed by Oracle and passed down to the storage servers from the database servers. Storage Indexes take up no physical storage of themselves and are built and maintained entirely in memory. As only this very basic summary information is stored for a maximum of 8 columns for each 1M of storage, Storage Indexes are very lightweight and can be created and maintained with minimal general overheads. So how are they used ? During an Exadata Smart Scan, Oracle can perform predicate filtering down at the storage layer and so only return just the rows of interest back up to the database. As part of this process, Oracle can use the Storage Indexes to visit just the 1M storage regions that can potentially contain rows of interest. Those storage regions that can’t possibly contain data of interest can be eliminated and not accessed at all during the Smart Scan operation. So, in a very simple example, if we have an SQL predicate such as WHERE CODE = 5, if a corresponding Storage Index on the CODE column of the first 1M region of the table has MIN=2 and MAX=10, Oracle would need to access this portion of the table as the CODE value of interest could potentially exist here. However, if the next 1M storage region had a CODE Storage Index with a MIN=7 and MAX=12, then the CODE value of 5 can’t possibly exist within this portion of the table and can be ignored and not accessed at all during the Smart Scan. So depending on the column, predicates and data distribution, a Storage Index can potentially eliminate having to physically access significant portions of a table during a Smart Scan. In an extreme example, on a search of a CODE value = 42 where the maximum CODE value that actually exists is say 35, a Smart Scan can perform a so-called Full Table Scan (FTS) via a Storage Index that doesn’t actually have to perform any physical I/O at all and can ignore the entire table. The less physical I/O performed, the less work required and the faster the response time. If a FTS of say a 500GB table only had to physically read and access a few MBs here and there AND just return the data of interest back to the database servers, that would significantly improve the overall performance and overheads associated with the FTS. Storage Indexes can be very cool indeed.